When Gabe and I were recently in London, we were lucky to be able to stay with his older brother and sister-in-law. Aside from the awesome company, one of the major perks of staying with them was that we didn’t have to scrounge around for breakfast each morning. They provided quite a spread of coffee, fruit, cereal, pastries, bread, yogurt, granola, and apricot preserves that I’m still dreaming about. 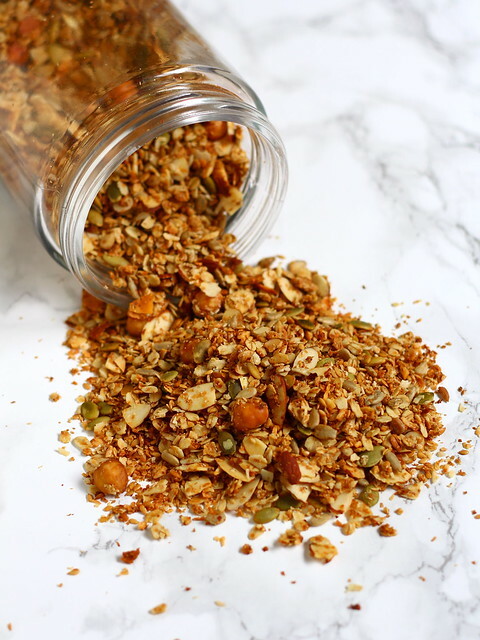 I quickly grew obsessed with the granola, a savory mixture of oats, nuts, and seeds. The thing I loved most was its delightful crispy crunchiness, which contrasted well with creamy yogurt and sweet fruit. I snapped a photo of the ingredient list on the back of the bag so I could try to recreate it once we got home. Of course, things in England are a wee bit different from the United States. Despite sharing a language with the mother country, the different names for certain foods left us scratching our heads at times during our visit. We quickly learned that aubergine is eggplant, courgette is zucchini, and yoghurt is… yogurt. So when we got home and I set out to make this granola, I had to google a few things. 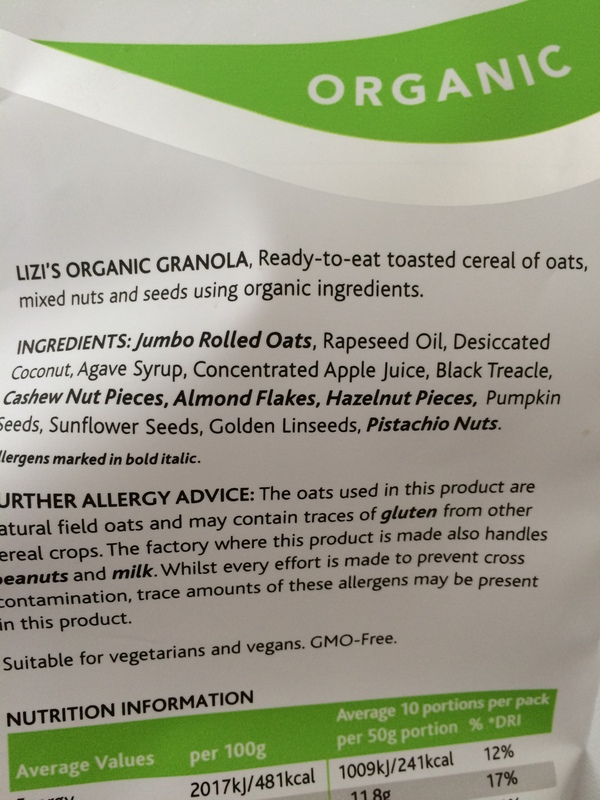 Turns out black treacle is molasses and linseeds are flaxseeds. Once my translations were complete, I set to work. 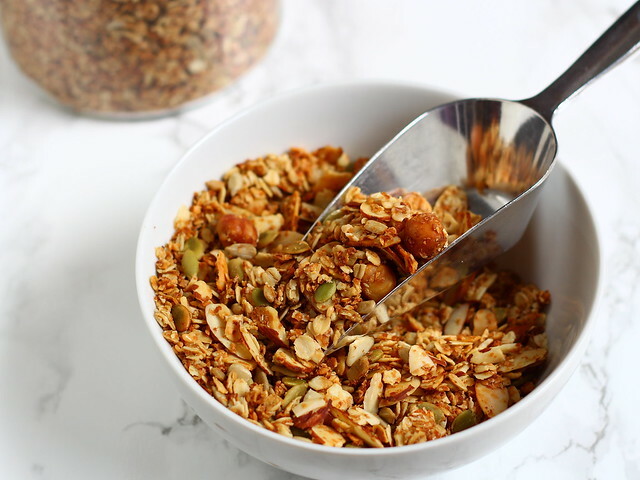 This granola has a number of different components, but it comes together easily and less expensively if you shop the bulk foods section of the grocery store, buying just the amount of nuts and seeds you need. Although the original recipe called for hazelnuts, cashews, and pistachios, I think you can get by with just one of the three, or sub in another nut of your choosing. Coconut oil and a fairly long baking time made the granola nice and crispy, adding a delightful crunch to my mornings now that I’m stateside again! Preheat oven to 300° F. In a large bowl, stir together oats. almonds, wheat germ, coconut, nuts, seeds, and salt. In a glass measuring cup, stir together coconut oil, water, honey and molasses. Pour the coconut oil mixture over the oat mixture and stir well, until the oat mixture is completely moistened. Pour the oat mixture onto a large rimmed baking sheet lined with aluminum foil. Bake for 45-55 minutes, stirring every 15 minutes or so, until the granola is browned and crunchy. Let cool. Store in an airtight container. Makes about 9 cups granola. 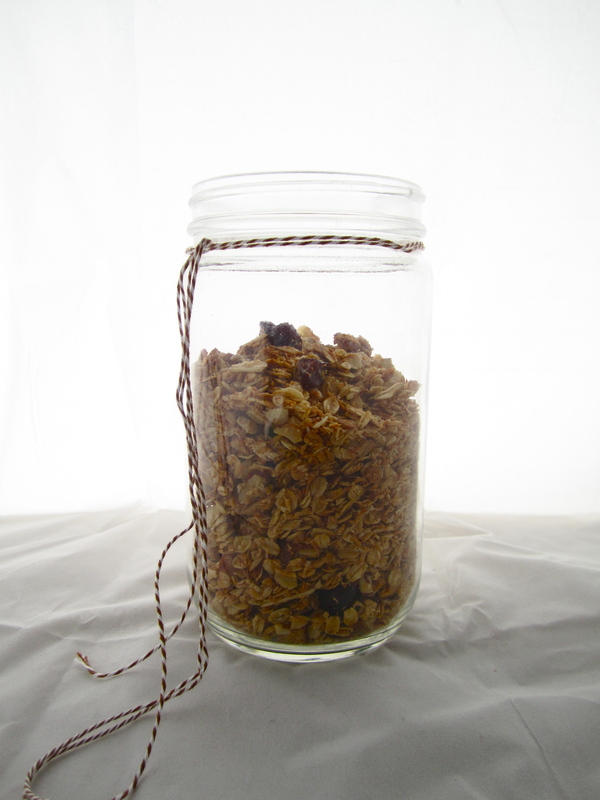 * Make sure all the nuts and seeds you buy for this recipe are unsalted, otherwise you will have a very salty granola! Source: A Lingonberry Jam original. Returning from a lovely but busy vacation, I had little motivation to cook. I basically just wanted Indian food or sushi delivered to my door for days on end. But now I have my mojo back. This became rapidly apparent when I decided to make homemade bagels last night. Starting at 9:00 PM. Hey, when inspiration strikes, go with it! I’ve made bagels before, but they turned out a little lumpy and flat. I think it was my shaping method. Take note: I highly recommend sticking your thumbs in the middle to make a hole rather than forming a log and joining the ends. It makes for prettier bagels. I also think the overnight resting period in this recipe plays a key role in developing the flavor. Making homemade bagels takes a fair amount of time and some strong biceps, but it’s so worth it. Next up, homemade cream cheese? Hmmm, I’m thinking about it… that would take some serious mojo. Make the sponge: In large bowl stir together yeast and flour. Stir in water until a sticky dough forms. Cover and place in a warm place for 1 to 2 hours, or until bubbly and doubled in size. Make the dough: When the sponge is ready, stir in the additional yeast, salt, and honey. Stir in 3 cups of bread flour until a ball forms. (You can use a stand mixer for this step if it’s easier.) Turn the dough onto a counter and knead for at least 10 minutes by hand, or 6 minutes if using a stand mixer. If the dough is too sticky, add additional flour. If it seems too dry, add a few drops of water. The dough is done when it’s firm but pliable and satiny smooth, not tacky. It should also pass the windowpane test. Divide the dough evenly into 16 pieces and form each piece into a roll. (I used a kitchen scale to help divide the dough, and each piece weighed 3.3 ounces.) 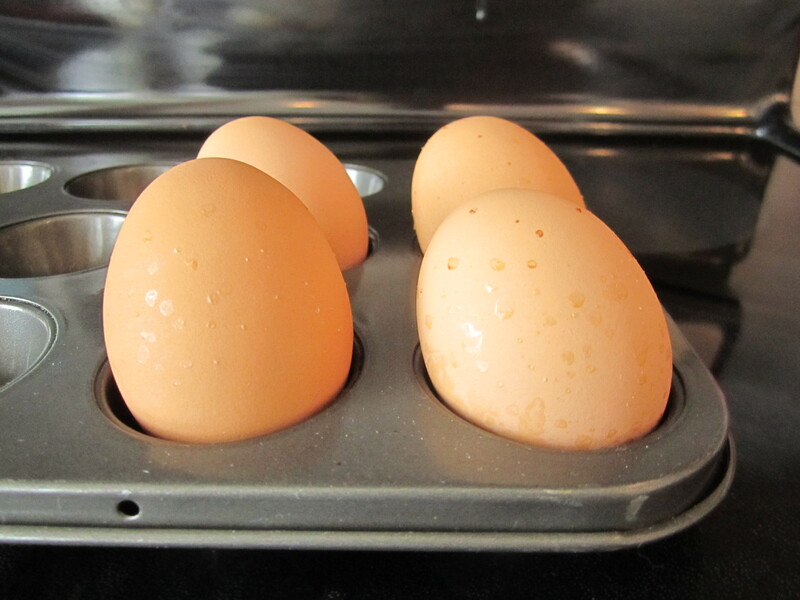 Cover with a damp towel and let stand at room temperature for 20 minutes. Meanwhile, line two baking sheets with parchment paper and spray lightly with oil. Shape each roll into a bagel by sticking your thumbs through the middle and carefully turning the dough until an even hole forms. The hole should be about 2 inches in diameter. Place the shaped bagels on the parchment-lined baking sheets and spray lightly with oil. Cover loosely with plastic wrap and let rest for another 20 minutes at room temperature. Time for the float test: Place a bagel in a bowl of water to see if it floats within 10 seconds. If the bagel doesn’t float, place it back on the baking sheet and let the bagels continue to rest for another few minutes. Try the float test again. Once the bagel floats, place the baking sheets (still covered with plastic wrap) in the refrigerator. Refrigerate overnight, or up to two days. When it’s time to bake the bagels, preheat oven to 475° F. Bring a large, wide pot of water to a boil and stir in baking soda. 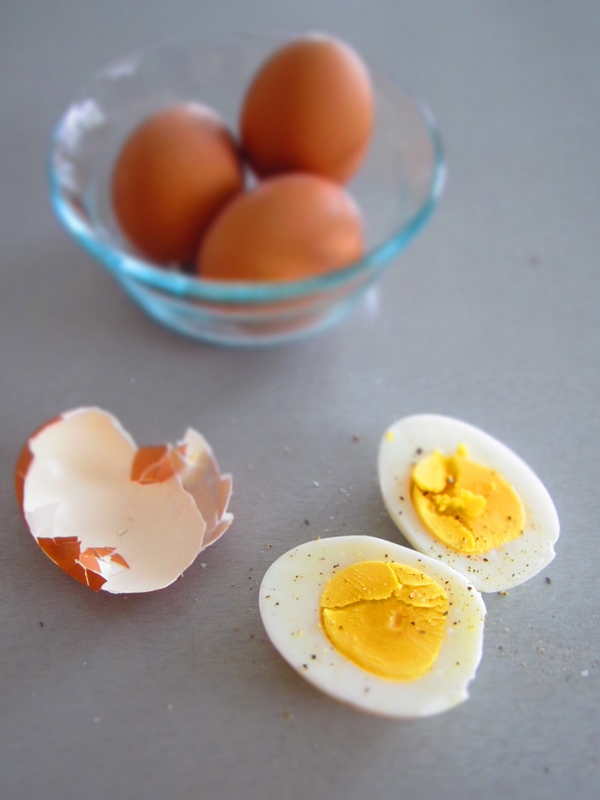 Prepare egg wash by beating together egg and water, and gather your toppings. Remove bagels from refrigerator. 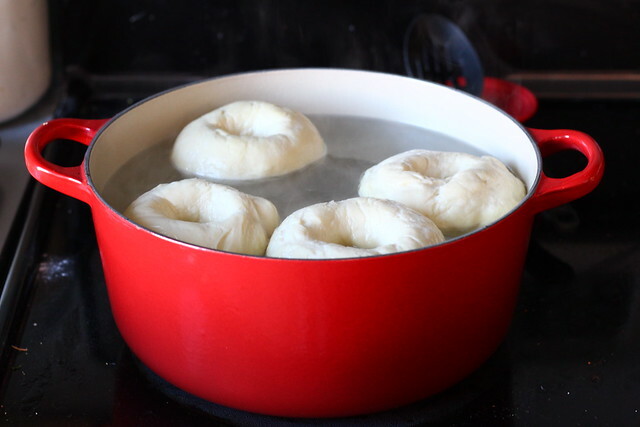 Carefully place bagels in boiling water– 3 or 4 at a time– and boil for one minute. 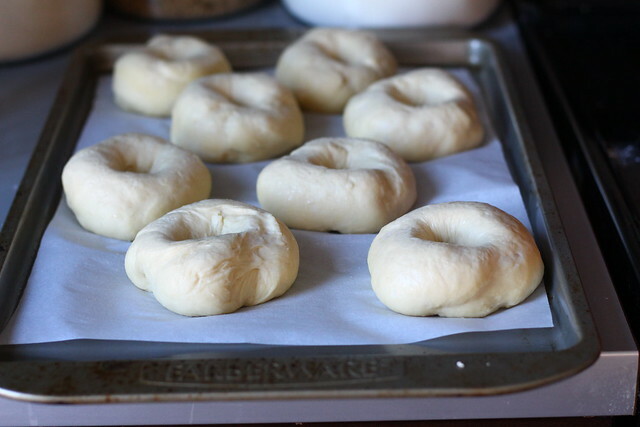 Flip bagels over and boil for one more minute. (You can boil them for two minutes on each side if you want chewier bagels.) While the bagels are boiling, sprinkle the empty spots on the parchment-lined baking sheets with cornmeal. 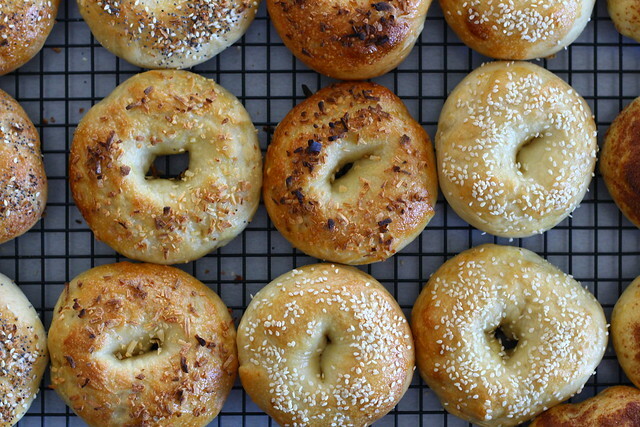 Using a slotted spoon, remove bagels from boiling water and place on baking sheets. Brush bagels with egg wash and sprinkle with desired toppings. Bake on center rack of oven for 5 minutes, turn the baking sheet 180° and bake for another 5 minutes, or until golden brown. (At this point you can bake for an additional 3-5 minutes if you want darker bagels.) Remove from oven and transfer to a cooling rack. Cool for at least 15 minutes before serving. Source: Slightly adapted from The Bread Baker’s Apprentice by Peter Reinhart via Smitten Kitchen. Cinnamon sugar: Stir together 1/4 cup of brown sugar with 1 Tbs. ground cinnamon. Cheese: Freshly grated parmesan or asiago. Garlic: Simply sprinkle with dehydrated minced garlic. Onion: Simply sprinkle with dehydrated minced onion. Sesame: Yup, just sprinkle with sesame seeds. Poppy seed: Okay, you get it. Sprinkle with poppy seeds. I’m a weekend morning person. Monday through Friday, I’ll pull the covers over my head and pretend to be asleep while Gabe dutifully heads off to the gym, but come Saturday, I’m ready to wake up. 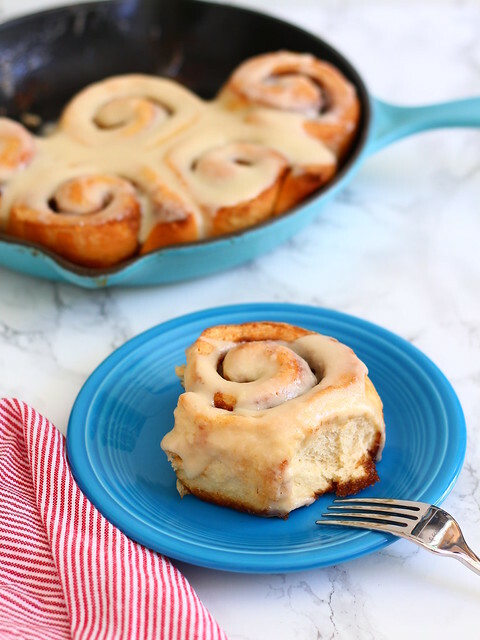 There’s something so magical about getting up slowly– not at the request of an alarm clock– and padding into the kitchen to make a cup of coffee, knowing that I can stay in my pajamas all morning if I like. Quiet weekend mornings are totally my jam. Last Saturday, in preparation for Gabe’s parents’ arrival from Los Angeles, we decided it was our duty to scope out the local bagel scene. So we woke up early, threw on some clothes, and headed outside. The pale morning sun hesitantly reached toward our backs as we walked hand-in-hand down a hushed Lyndale Avenue. We ended up at Common Roots Cafe and sat down to a breakfast of iced lattes and fresh bagels. 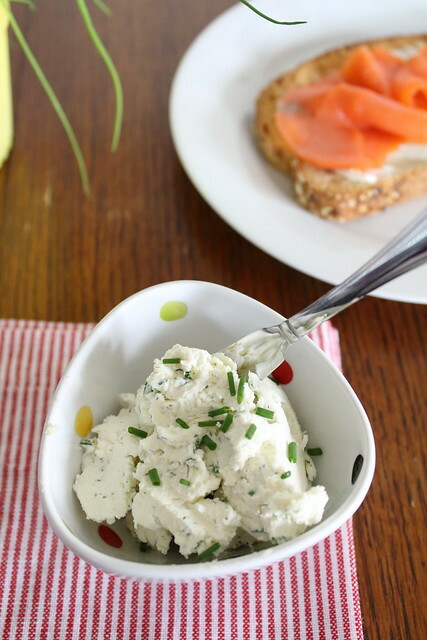 I topped my bagel with a tantalizing spread of garlic, dill, and chive cream cheese. The raw garlic zinged my tongue, energizing me as much as the sunlight now flooding the cafe. Gabe and I soaked up the simple food and quiet company, and waited for the rest of the world to wake and join us. Place the cream cheese in a small bowl and soften in the microwave by heating it on half power for 30 seconds. Remove from microwave and stir until smooth. Add the garlic, dill, and chives and stir until well combined. Add salt and pepper, if desired. Source: Inspired by Common Roots Cafe. For about a year in Boston, I ate the exact same thing for breakfast every day. Grandma’s granola, a touch of greek yogurt, and fresh strawberries. It was easy, nutritious, and scrumptious. And then one day, I woke up and was tired of it. I retried some old standbys, but found that frosted mini-wheats were suddenly too sweet and oatmeal squares too bland. And so, this week, I went back to granola. But I still wanted to try something new. I switched out the walnuts for almonds and stirred the granola to break it up more (her original recipe called for ginormous clusters), but otherwise not much was changed. The maple syrup– all the way from Canada!– adds a hint of sweetness balanced out by kosher salt. It’s the perfect start to my morning. Preheat oven to 300° F. In a large bowl, stir together everything but the egg white and dried cherries. Whip the egg white in a small bowl until foamy. Stir egg white into the oat mixture. Evenly spread granola onto a foil-lined baking sheet and bake for 45 minutes, stirring halfway through. 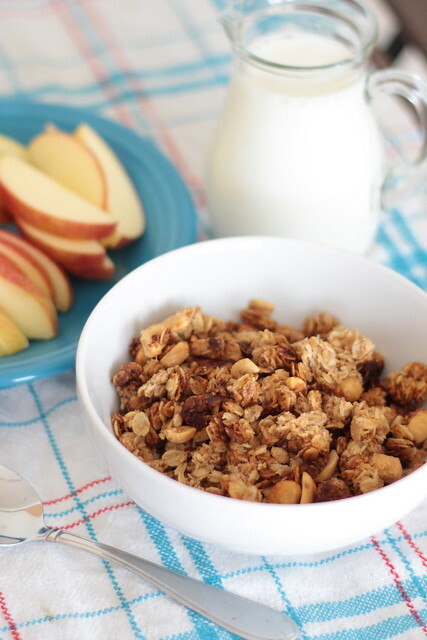 The granola is done when it’s lightly browned and dry to the touch. Stir in cherries and let cool completely. Store in an airtight container at room temperature for up to two weeks. Nutrition facts (per 1/2 cup): 210 calories, 8.7 g fat, 29.9 g carbs, 3.8 g fiber, 4.7 g protein. Source: Slightly adapted from The Smitten Kitchen Cookbook.